Marwood Metal Fabrication Ltd. is a Tillsonburg, Ontario-based supplier of metal stampings and assemblies who supplies some of the world’s largest automotive original equipment manufacturers (OEMs). Since being founded in 1990, they have enjoyed great success and have scaled-up over time to provide customers with more innovative products and services. Growth in recent years has enabled Marwood to employ hundreds of skilled workers in their five Ontario-based plants. While internal strengths and a dedication to quality provided them with the basis for success, they’ve also benefitted from using Canadian government funding to finance their growth strategies. Marwood Metal has been skilfully executing a Proactive Funding Plan™ to fuel their growth during this time. By leveraging a combination of Canadian government grants and loans to strategically reduce project expenses, cash flow can be greatly extended. Marwood’s Director of Finance, Leon Thoonen, spoke with Mentor Works to discuss how their Proactive Funding Plan™ has helped to receive additional project funding. The details of their funding successes are as follows. How did Marwood first learn about Canadian government funding programs? Leon developed a prior awareness of government grants and funding sources through the news and colleagues of his. 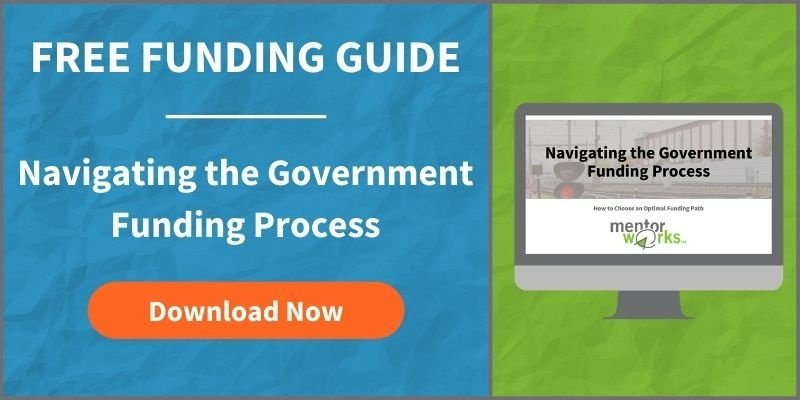 Business owners and executives generally carry prior knowledge that government funding is out there, but simply don’t know the process of obtaining it. Although the process of accessing government funding can be challenging, Mentor Works seeks to clarify what’s required from businesses. Economic development offices regularly recommend businesses to Mentor Works for our helpful, educational, and time-saving processes. How did funding improve the scope of your project? Expanded project scopes are a common benefit of accessing Canadian government funding. By accessing extra funding during the project, companies can plan and implement more effective projects that build competitiveness and grow market share. Financing projects without Canadian government funding minimizes cash flow and can lead to smaller budgets; business leaders should always consider funding as a method to boost project scope. What role did Mentor Works play in the funding process? Mentor Works assists companies to strategically plan and apply for government grants and loans. Through working with Marwood, Mentor Works created a Proactive Funding Plan™ to identify funding opportunities, then accelerated the application process for opportunities Marwood’s management team had interest in. Small business grant and loan applications can be long, detailed, and even complicated to complete at times. This is where Mentor Works’ value is really leveraged; with a full understanding of the priorities, timelines, and impacts sought from government reviewers, it’s possible to simplify the process. Mentor Works is the external help that most businesses need to receive government grants and loans. We’re pleased to see the positive results that it’s brought for Marwood Metal Fabrication! Marwood Metal Fabrication is dedicated to using government grants and loans to offset project costs. For each new strategic project implemented, Marwood consults Mentor Works to consider if there are valuable government programs to use. This continuous project planning that involves government grants and loans is the basis of a Proactive Funding Plan™. Funding plans identify grants and other incentives that should be considered (and applied for) ahead of project start dates. Southwestern Ontario Development Fund (SWODF): Provides Ontario government funding to businesses expanding their operations in the province while improving the economic landscape by creating jobs and increasing export revenue. The program provides up to 10-15% of project expenses to a maximum $1.5 million in government grants; project budgets exceeding $10 million may qualify for up to $5 million in funding including up to $3.5 million in small business loans. Marwood stacked funding from SWODF with IBGP loans (see below) to assist with a major investment in hot stamping. Canada-Ontario Job Grant (COJG): Allocates training grants to Ontario-based organizations who are implementing third-party employee training programs. Through COJG, employers may access up to 66-83% of costs to a maximum $10,000/trainee to help their employees gain the skills needed to perform new tasks. In fact, employers may access the program every 6 months to consistently improve the skillsets of workers. Marwood has strategically used this 6-month rule to implement more training programs and has leveraged over $100,000 through COJG. FedDev Ontario Training Program: Funds internal and third-party training programs developed to improve the skills of manufacturing employees. The program supports Ontario manufacturers by providing up to $50,000 in training grants to improve employee innovation and technical ability. Through this program, Marwood employees received training on welding, press operation, robotics software programming, among other areas critical to their continued growth. CME SMART Advanced Technologies for Global Growth: Supported the assessment of current manufacturing processes and the adoption of new technologies to become more efficient. For Marwood, a maximum $100,000 was secured through the program which enabled the purchase of a high-efficiency servo press. Although CME SMART ATGG is now closed, Ontario manufacturers may be able to receive support for manufacturing technology investments through the CME SMART Green Fund. FedDev Ontario Investing in Business Growth and Prosperity (IBGP): Provided a 0% interest federal loan to southern Ontario businesses worth up to 25% of eligible project costs to a maximum $20 million. This government funding program was designed to attract and support large-scale investment from high-growth companies improving their productivity through process improvements. Marwood leveraged these funds in addition to SWODF funding (above) to expand their facility and complete a large investment in hot stamping technology which significantly increased production and innovation. Marwood Metal Fabrication has received government grants and loans to extend cash flow for a series of strategic projects. Their success is a benchmark for other businesses who have, or plan to use Canadian government funding as a method of business financing. A major element of Marwood’s success was the ability to develop and execute a strategic plan for funding. By working with Mentor Works to develop a Proactive Funding Plan™, the company leveraged additional funds and draw less project funding from their retained earnings. This extra cash flow improves the frequency and outcome of projects. If you’re interested in developing a Proactive Funding Plan™ for grants and loans, please download Mentor Works’ How to Build a Proactive Funding Plan™ slide deck.